Sunday August 19, 2018 - Inspector General of Police, Joseph Boinett, has admitted that the Government has beefed up the security of Director of Public Prosecutions, Nordin Hajj, and Director of Criminal Investigations, George Kinoti, over the ongoing purge against corruption. The two individuals have taken the corruption fight to a new level where Kenyans are now seeing high profile politicians and State officers being arrested and taken to court for stealing public money. More security personnel have been brought to guard them as concerns mount that the wealthy and politically connected who have fallen victim of the purge may harm them. 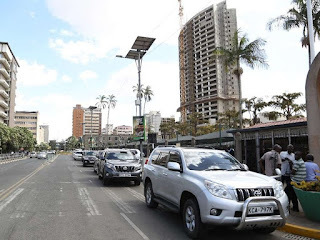 Getting to Haji’s 19th floor office at NSSF building is no longer easy as numerous security measures have been implemented. The same applies to the Director of Criminal Investigations (DCI) George Kinoti and other key detectives leading the investigations. Boinnet said the Government must protect individuals who are jailing criminals in suits and Prados. “We know they are very dangerous and we are alive to the risks our officers fighting corruption face,” Boinett said.